This is the third year in a row I’ve released a new, updated version of the referral source list. That is because each year readers like you have helped it grow to now over 400 companies and other potential referral sources. These are companies that send you records review work you can do from home in your pajamas or examinations you can perform without worrying about managed care headaches. It is a great way to supplement your income or carve out a special niche outside of traditional practice. This is the third edition and it likely won’t be updated as quickly (I don’t plan to publish an update next Thanksgiving unless substantial changes to the list happen between now and then). If you’re going to get a copy of the list it might as well be the third edition because it may be a while before the fourth edition is published. 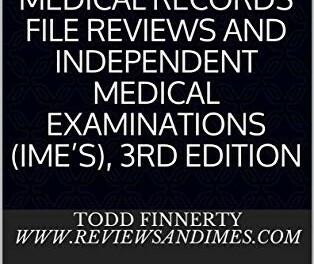 This is Your Little Black Book For Success in Reviews & IME’s; it’s a directory of over 400 referral sources for health care professionals interested in records review and/or IME work. This isn’t some vague academic text about non-clinical careers, this book gives you a list of companies to contact to start getting referrals for records review work and/or independent medical examinations (as well as some to contact for non-clinical career opportunities related to this).